Now that your student has completed their first semester and has begun second semester classes, you may be wondering about what campus resources to assist with your student’s academic success. Student satisfaction and success research suggests that students who are satisfied with their university experience tend to perform well in college. Factors that contribute to student success include connecting with others, utilizing faculty office hours, getting involved in activities and events, staying healthy, and taking advantage of campus resources. Some examples of important campus resources include Academic Advising which provides personalized developmental advising to first-year, new transfer, and undeclared students. Through one-to-one and group sessions, students receive information and support to help them become good decision-makers and managers of their academic career. 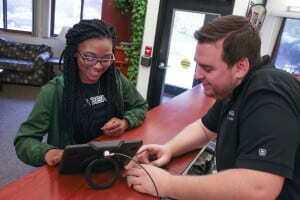 Another campus service commonly used by students is Tutoring Services offering one-to-one and group tutoring services for a variety of courses. The Counseling and Health Center offers on-campus counseling and health services including free counseling services by licensed professional counselors and limited psychiatric services. The center also offers access to nurses for minor illnesses, vaccinations, and much more. Finally, the Office of Residence Life employs five Area Coordinators (ACs) each supervising an “area” of residence hall and apartment buildings. Our goal is to provide guidance and advisement to students who need a Resident Assistant or Area Coordinator’s assistance, and to make appropriate referrals to campus offices and services. Students may schedule an appointment with their Area Coordinator by contacting the front desk of the Office of Residence Life, (920) 465-2040.